'Truth be told, Amrita Singh and Saif Ali Khan's daughter has tons of filmi blood and it is what powers Kedarnath from start to finish,' says Sukanya Verma. In a bid to spite her disapproving father, a defiant Madhuri Dixit stabs a broken wine bottle into her arm and vows to meet her beau come what may. Hysteria abounds, but Madhuri's impetuous intensity in Dil makes it work. 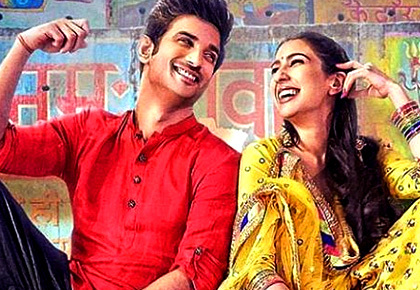 When Sara Ali Khan slits her finger to prove a point to her bigot daddy in Kedarnath, she exhibits the same degree of ridiculous, romanticised rebellion that turns young ladies of Bollywood love stories into enthusiastic endorsers of self-inflicted violence. Except the newcomer's 'yeah so?' spirit is utterly disarming and injects fresh blood into an old body. The first time we see Sara -- the camera captures her from an odd, distant angle. She is squabbling with a porter about her ruined footwear. It's as though director Abhishek Kapoor wants us to sniff her charisma even when she is almost out of the frame. When she is at its centre though, Sara is the heart of Kedarnath. Much honesty and impishness colour her portrayal of a headstrong romantic wolfing down Maggi and making eyes at the handsome pithoo who just won't sip chai from her glass. The smug smile that lights her face when he finally relents is telling of the performer she is meant to be. Sara plays Mukku, short for Mandakini, daughter of the local respected Brahmin (Nitish Bharadwaj) whose hypocrisy is thinly veiled under his skin-deep liberalism. Cuttingly addressing him as Pandit not Pitaji, she openly resents the limited agency allowed to the women of her household. Her stylish wardrobe makes that a tad hard to believe. Known for their sartorial flamboyance, designer duo Abu Jani-Sandeep Khosla's playful if hardly realistic wardrobe for Sara resists grandiosity, as they know it. But their love for couture eventually catches up by the time it is the turn of the big bridal lehenga. Mukku loathes her mother's (Sonali Sachdev) compromised existence and is angered by her sister's (a lovely Pooja Gor) humiliation at the hands of a fiancé (Nishant Dahiya, full of rakish arrogance) they have had the misfortune to share. At times sparring, often silently communicating, Kapoor captures the sibling ups and down with impressive tenderness. When circumstances prompt Mukku to grow close to a Muslim porter Mansoor (Sushant Singh Rajput), she grabs it as an opportunity to break the norms. For all her first moves though, the courtship and conflicts it gives rise to are awfully hackneyed. It's 2013 and people in love are still collecting handkerchiefs and jhoomkas or giving dharna outside the sweetheart's house in pouring rain until change of heart happens. Add to this, the now tired trope of an old classic song for emotional effect. It must be said, Bollywood's Lag Ja Gale obsession has gotten out of hand now. The sooner it finds another vintage ditty to ruin in overkill, the better. 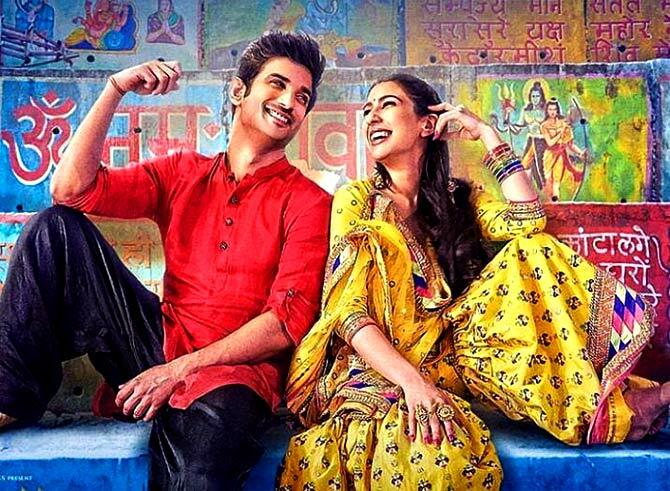 The heft and conviction of a sparkling Sara and subdued Sushant as well as its solid supporting cast make Kedarnath's stereotypes and contrivances a whole lot agreeable. Scenes like Mukku's father punishing her by dipping her in frozen water like a tea bag or arguments between the pandits and pithoos taking a communal turn are woefully over the top, but the cast's composed energy strains out some of the excessive melodrama. Like instead of making the usual hue and cry on watching her man getting beaten up, Sara coolly states, 'Itne main hi mar gaya toh aage kaise jhelega? Truth be told, Amrita Singh and Saif Ali Khan's daughter has tons of filmi blood and it is what powers Kedarnath from start to finish. Dedicated to the memory of those who lost their lives in the 2013 Uttarakhand floods, Kedarnath delays its disaster theme up until the third act to build on its Hindu-Muslim romance against a majestic mountainous range enveloping the pilgrimage town. There are allusions to infrastructural mismanagement evoking the wrath of nature, but Kedarnath doesn't meditate on the politics of religion or commercialisation as much as employ it for short-lived obstacle. Dubbed as the Himalayan tsunami, the devastating loss of life and property is best understood in the footage that shows up at end. The VFX recreating the actual tragedy, across wishy-washy images of an enormous deluge and solitary choppers, is horribly synthetic and cannot convey the magnitude, danger or chaos. None of the hurried tears, sacrifices or theatrics leading to its loopholed developments and unsurprising losses achieves the Titanic scale Kapoor is aiming for. But a S(it)ara is well and truly born. And in a launchpad, isn't that all that matters? What's Sara doing in Switzerland?